In order to view prices, stock levels or to make a purchase you must be logged into your trade account. If you’re on a gluten-, wheat- or dairy-free diet, you can still enjoy the classic taste of a light and fluffy sponge cake thanks to one of Britain’s favourite chefs, Phil Vickery, and Squires Kitchen. 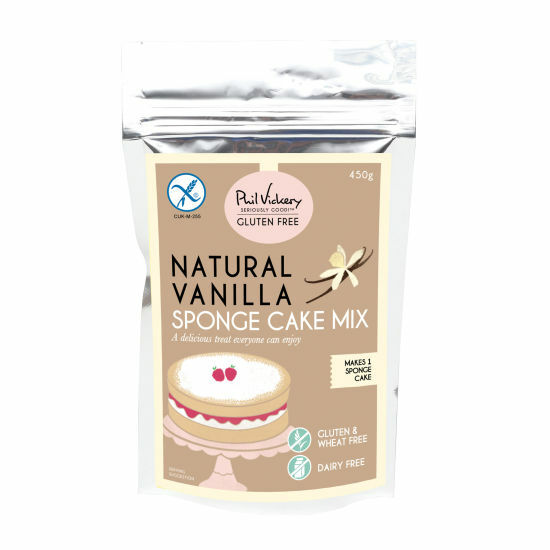 The Phil Vickery Seriously Good!™ Gluten Free Natural Vanilla Sponge Cake Mix makes it really easy to achieve great results when baking gluten-free birthday cakes, wedding cakes and other celebration cakes. Use SK Fondant Icing Mix for a perfect natural icing that is quick and easy to make. The Natural Vanilla Sponge Cake Mix allows you to bake two 20.5cm (8”) round gluten-free, wheat-free and dairy-free sponge cakes, which can be sandwiched together with your choice of filling. Try creating a delicious gluten- and dairy-free buttercream with the Phil Vickery Seriously Good!™ Gluten Free Fondant Icing Mixes. What’s more, all products in the Phil Vickery Seriously Good!™ Gluten Free range are certified gluten free by Coeliac UK, giving you true peace of mind. You can also rest assured that the entire range is wheat free, dairy free, suitable for vegetarians and contains no artificial colours, preservatives or flavourings. You will need: 225g softened butter or dairy-free margarine, 4 medium eggs, 1-3tbsp water, two 20.5cm (8") x 4cm (1.5") metal sponge tins. Preheat the oven to 170°C / fan 150°C / 325°F / gas mark 3. Beat the softened butter or dairy-free margarine until creamy and light. On a slow speed, gradually add alternate amounts of the dry cake mix, eggs and water. The quantity of water needed will vary with the ingredients: add 1-3tbsp until you have a soft batter. Whisk only for a few seconds until evenly mixed. Overbeating may cause the batter to become sticky and the cake less light. Weigh the mixture evenly into two sponge tins and level the tops. Bake near the centre of a preheated oven for 30-35 minutes until the surface is golden and springs back to the touch. Allow to cool for 10 minutes then gently loosen the sides of the tin. Turn the cakes out onto a wire cooling rack. You can use a flat baking tray or the cooling rack to help top the cakes out. Once cool, sandwich the two cakes together with your chosen filling and dust with icing sugar to serve. Enjoy the cake when fresh, or wrap and freeze the whole cake.